Looking for some Easter Basket ideas for your 2 or 3 year old? Me too! 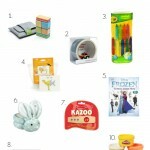 This is the first year our 2.5 year old will really understand the whole Easter Basket thing, and I want to get her some things that she’ll love and actually use for more than a day or two. We focus on the story and meaning of Easter (the empty tomb!) and though I don’t think we’re going to even do the whole Easter Bunny thing with her, I still want to give her a few small things in an Easter Basket, just for fun! Now, I don’t really like cheap, plastic-y, electronic toys – I much prefer toys that will encourage imaginative play and creativity. 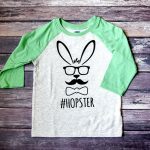 So if you’re like me and you’re looking for some ideas for your little one, here’s a list of some things that will be in our little girl’s Easter Basket (along with some things she already has and loves)…and the best part is, they are all “mom-approved” – nothing electronic, nothing too expensive, and no candy!! Magnetic Block Set – these are even great for babies as young as around 10 months. They’re perfect for throwing in your purse for entertainment on the go, like waiting at a restaurant. 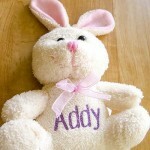 Jellycat Bunny – incredibly soft and cuddly, and perfect for Easter! Books – throw in a few new books, like this one – such a cute book with a great message! Outdoor Toys – as the weather warms up, it’s a great time to replenish your stock of sidewalk chalk and bubbles! Paint with Water Books – this is a low-mess way for your little one to paint at the kitchen table. My daughter has already gone through one of these books and is halfway through her second! Wooden Puzzles – you can’t go wrong with wooden puzzles, especially when they’re learning their alphabet and colors at the same time! Play Doh – my little girl loves Play Doh, and how cute are these little egg shaped containers? I hope this list inspired you with some new ideas! 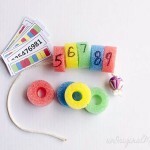 What are some of your favorite toys for 2 and 3 year olds? These are amazing ideas! Thanks for sharing! I found some ‘eggs’ at Home Depot that had potting medium and seeds inside. Your little one can tap the top with a spoon and remove the shell at the top. Adding water and watching it grow can happen over the rest of spring.